The International Center on Nonviolent Conflict welcomes the submission of presentation proposals for our Webinar Series on Civil Resistance for 2019. ICNC’s Webinars are usually 60 minute online events that combine a 30 minute individual or group presentation on critical ideas, cases, and questions related to civil resistance and nonviolent movements with a substantive Q & A discussion with the audience. Webinars are streamed live and the recordings are posted on ICNC’s website for future viewing. ICNC Webinars are an opportunity for scholars and practitioners of civil resistance to share their knowledge and experience in an accessible format to an international audience. As noted, webinar presentations are facilitated by ICNC staff and feature a live Q&A session after the presentation. The webinars are hosted by ICNC’s webinar platform and ICNC provides technical assistance to the presenter(s). Webinars typically have between 50-100 live attendees with over 100 additional registrants. All registrants receive a recording of the webinar presentation and the webinar is posted publicly on ICNC’s website and YouTube page for additional viewing. Webinar presenters are offered a modest honorarium ranging between $200 to $400, depending on the number of presenters in a webinar and the speakers’ experience. The webinars are offered once a month with a possible down time during the summer. Webinars are typically held from 12:00pm – 1:00pm EST on Tuesdays, Wednesdays, or Thursdays, but we may be able to make scheduling accommodations. The formats of the webinars include, among others, panel talks, interactive discussions and forums, and individual PowerPoint presentations, as well as live question and answer sessions with the audience. After the webinars, we ask the speakers to send written responses to the questions that were not addressed during Q/A that are then shared with the registered participants. We also encourage speakers to recommend and send preliminary online readings prior to the presentation that might be shared in advance with those who register for the webinar and will be posted on the webpage for the presentation. Webinar proposals should be mindful of ICNC’s definition of civil resistance. Proposals can include analysis of related fields, such as peacebuilding, conflict mitigation, human rights, etc. but should maintain a primary focus on civil resistance. 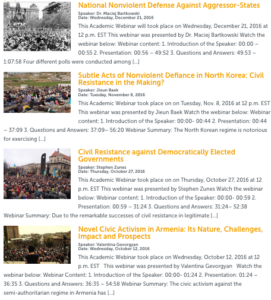 We particularly encourage the submission of webinar proposals that explore relatively under-discussed or under-researched topics on civil resistance and nonviolent movements. We are also interested in proposals that bring an analysis and perspective on nonviolent conflict informed directly by field experience and/or voices of practitioners. Prospective applicants are encouraged to review past ICNC Webinar recordings and the list of topics that are of interest to ICNC. All ICNC webinars can be viewed here. Dr. Elizabeth Wilson: Can People Power Movements Strengthen International Human Rights Law? ICNC Webinar proposals can be submitted here. Please make sure to answer the application questions as thoroughly as possible. Applications are accepted, with March being the first slot available.